Ultrasonic cavitation is a highly effective mechanical method to isolate stem cells from human adipose tissue. Ultrasonically isolated stromal vascular fraction (SVF) show a high regenerative potential for medical applications. 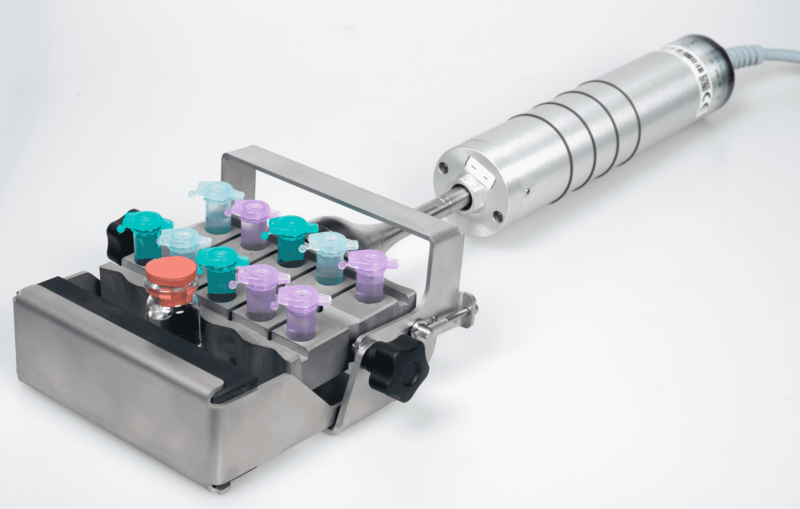 Hielscher Ultrasonics offers various options of direct and indirect sonication for harvesting stem cells. From the human body extracted adipose tissue (via liposuction) is treated by ultrasonication to remove the tissue from the stem cells and other growth cells. This separated portion of cells is known as stromal vascular fraction cells (SVF). The ultrasonic isolation technique of stem cells from adipose tissue is based solely on the working principle of ultrasonic-derived cavitation, which is mechanical shear. The cavitational shear forces disrupt the adipose tissue, so that the stem cells are released from the structure of the fat tissue. The ultrasonic stem cell isolation is an enzyme-free procedure, avoiding the use of collagenase, trypsin, or dispase. To separate the extracted stem cells, mesenchymal stem cells, endothelial precursors and other growth cell types, the sonicated adipose tissue is centrifuged. 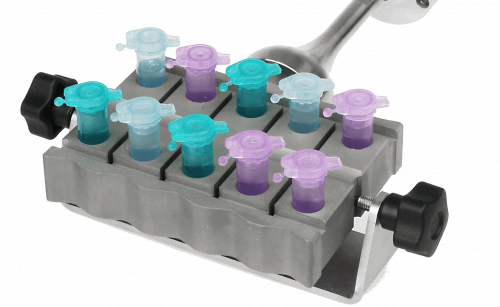 The separated stem cells are collected and analyzed for their quality including cell count, viability, endotoxin, and gram stain before used immediately for autologous transplantation or are preserved in cryo-storage. Since the enzymatic digestion for stem cell isolation is accompanied with high costs and possible safety risks as well as lacking efficacy [Oberbauer et al. 2015], non-enzymatic isolation methods such as ultrasonic cavitation are preferred. The ultrasonic isolation step supersedes the enzymatic digestion by separating the cells and cell aggregates mechanically from the adipose tissue. Published SVF isolation method using ultrasonic cavitation yield in 1.67–2.24 × 107 cells with a viability of 97.1–98.9% [Victor, S., 2014]. Cell yields of about 2–4 million cells/gram adipose tissue were obtained by the ultrasonic lysis of mature adipocytes in dissociated adipose tissue [Bright et al., 2014]. 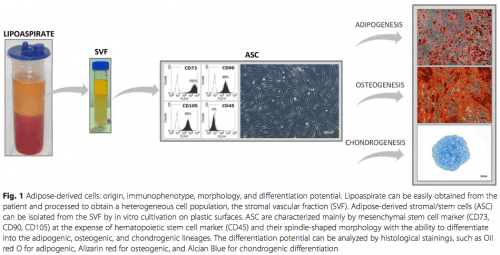 Ultrasonically prepared cells possess equally high adipogenic and osteogenic differentiation potential, compared to a standard enzymatic isolation method [Oberbauer et al. 2015]. To ensure highest safety and best quality, reliable ultrasonic equipment, which allows for precise control over the stem cell treatment, is a key factor for a successful treatment of the patients. 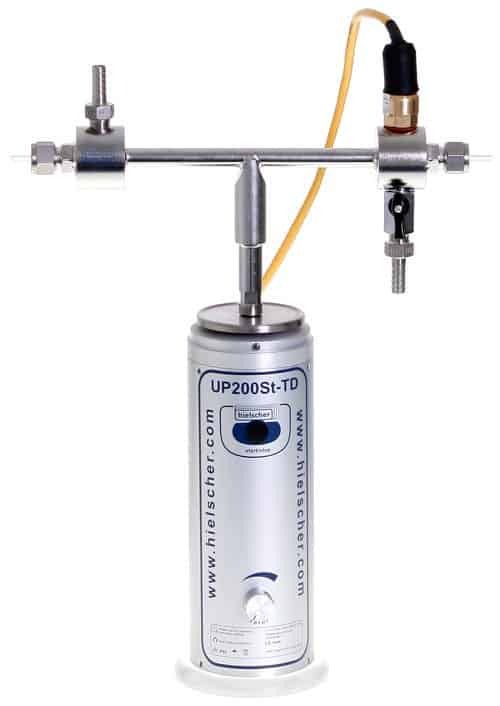 Hielscher Ultrasonics offers various options for an autologous ultrasonic cavitation separation process to isolate and harvest stem and endothelial precursor cells. For the stem cell isolation process via direct sonication, the ultrasonic horn (sonotrode, ultrasonic tip / probe) is immersed into the adipose fat tissue. Via the sonotrode, the ultrasound waves are coupled directly into the autologous fat so that the ultrasonic cavitation releases the stem cells and stromal cells from the residual tissue. 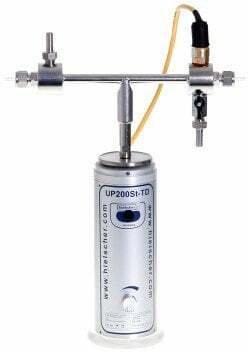 Hielscher ultrasonic processors UP200Ht and UP200St with sonotrode S26d14 are commonly used systems for the autologous stem cell treatment. The SVF isolation by direct sonication is mostly suitable for use in cleanroom facilities. Since the stem cells are used for autologous applications, sterility of the process is very important. Therefore, Hielscher has developed several options of indirect sonication such as GDmini2, VialTweeter and other customized systems. By indirect sonication, the ultrasound waves are coupled through the wall container into the adipose tissue. The stromal vascular fraction (SVF) is dissociated from the adipose tissue by ultrasonic cavitation as same as during direct sonication. 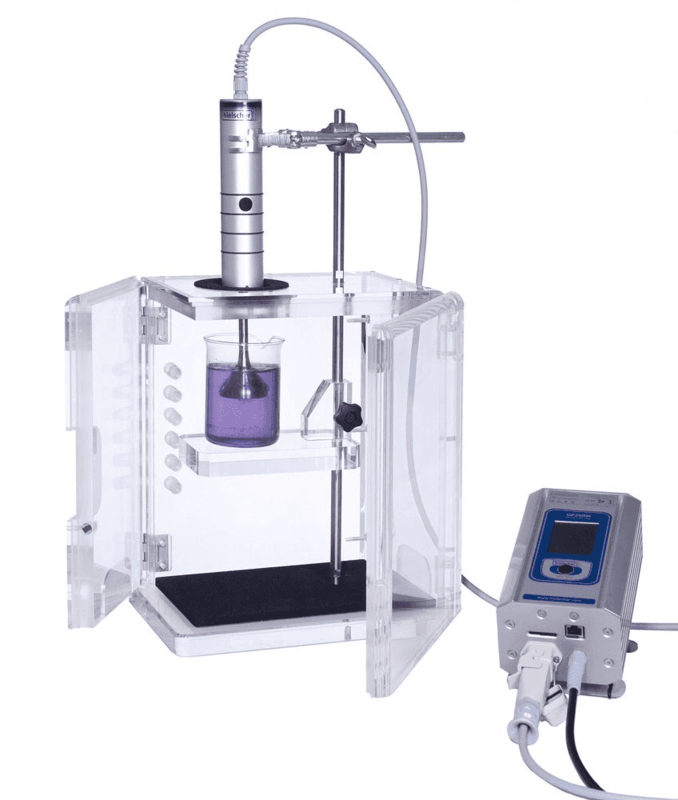 The indirect sonication process offers the advantage to process the cells in a closed vessel under contamination-free conditions since the risk of cross-contamination by inserting the ultrasound horn (sonotrode) is eliminated. The cell isolation is carried out in a closed system ensuring sterile process conditions. Hielscher’s digital ultrasonic devices can be precisely controlled via touch display or browser control. Sonication procedures can be pre-set via the intuitive menu. The ultrasonic devices are equipped with an automatic data recording (all sonication proces data are stored on an integrated SD-Card). The ultrasonic power input can be exactly adjusted to the cell isolation protocol. Oberbauer, Eleni; Steffenhagen, Carolin; Wurzer, Christoph; Gabriel, Christian; Redl, Heinz; Wolbank, Susanne (2015): Enzymatic and non-enzymatic isolation systems for adipose tissue-derived cells: current state of the art. Cell Regeneration (2015) 4:7. Stem cells are undifferentiated cells of a multicellular organism which have the capability to produce indefinitely more cells of the same type. They are characterized by the remarkable potential to develop into many different cell types in the body during the early state of life and growth. The most distinguishing feature of stem cells are their capability to renew themselves by cell division and their capability to turn into tissue- or organ-specific cells with special functions. Pluripotent stem cells have the potential to differentiate into any of the three germ cells: endoderm (interior stomach lining, gastrointestinal tract, lungs), mesoderm (muscle, bone, blood, urogenital), or ectoderm (epidermal tissues and nervous system). In some organs, such as the gut and bone marrow, stem cells regularly divide to repair and replace worn out or damaged tissues. In other organs, such as the pancreas and the heart, stem cells only divide under special conditions. Mesenchymal stromal/stem cells (MSC), which offer a high potential for manifold therapeutic applications in regenerative and aestethic medicine, are mainly found in the bone marrow, but they can be isolated from other tissues (e.g. cartilage, fat, muscle cells), too. Mesenchymal stem cells are considered as prototypical adult stem cells that are characterized by their capacity of self-renewal. Stem cell research and treatments are used to cultivate tissue and organs for transplantation purposes (tissue engineering). Other medical fields for the application of stem cells can be found in the treatment of brain disease (e.g. Parkinson’s and Alzheimer’s disease), cell deficiency therapy, blood disease (e.g. leukemia), joint and cartilage degeneration (e.g. osteoarthritis) as well as cosmetic treatments (e.g. anti-aging treatments). In general, stem cells have a size of approx. 15-25 micron in diameter. Mesenchymal stem cells (MSC) are multipotent stromal cells, which have the capability to differentiate into a variety of cell types, including osteoblasts (bone cells), chondrocytes (cartilage cells), myocytes (muscle cells), and adipocytes (fat cells). Stromal Vascular Fraction (SVF) is a component of the lipoaspirate which can be extracted via liposuction from adipose tissue in the human body. The lipoaspirate consists in a heterogeneous mixture of cells and has a high content of stem cells, known as adipose-derived stem cells (ASC or ADSC), which show similarities with bone marrow stem cells, such as their capability to differentiate into multilineage cells. The heterogeneous population of SVF includes endothelial cells, erythrocytes, fibroblasts, lymphocytes, monocytes/ macrophages, and pericytes among others, as well as an important fraction of adipose-derived stem cells. Adipose-derived stromal/stem cells (ASC / ADSC) release high levels of bioactive growth factors such as epidermal growth factor (EGF), vascular endothelial growth factor (VEGF), basic fibroblast growth factor (bFGF), keratinocyte growth factor (KGF), plateletderived growth factor (PDGF), hepatocyte growth factor (HGF), transforming growth factor-beta (TGF-β), insulin growth factor (IGF), and brain-derived neurotrophic factor (BDNF). ACS does not only release growth factors, they also secrete cytokines including fms-related tyrosine kinase 3 (Flt-3) ligand, granulocyte-colony stimulating factor (G-CSF), granulocyte macrophage-colony stimulating factor (GM-CSF), macrophage-colony stimulating factor (M-CSF), interleukin (IL) such as IL-6, IL-7, IL-8, IL-11, and IL-12, leukemia inhibitory factor (LIF), and tumor necrosis factor-alpha (TNF-α). Bone marrow, which requires extraction by harvesting, that is, drilling into bone. Blood, which requires extraction through apheresis, wherein the blood from the donor passes through a “dialysis” machine where the stem cells are extracted whilst the other blood components are returned back to the donor.